Dremel US40-02. 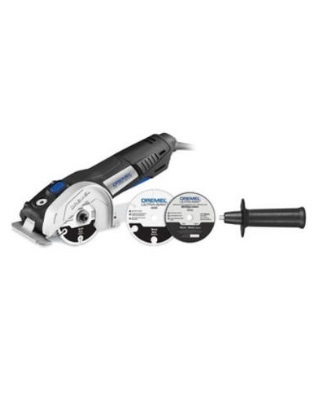 Features: 7.5 Amp motor for faster cutting and tougher applications. Faster speed of cut to rip through plywood and cut more metal. 3-in-1 tool to go beyond cutting and flush cutting with surface preparation applications including rust, paint, and thinset removal. Improved drive-train that lasts 3x longer than the Saw-Max for durability. Metal foot and guard handle for tough applications. Excellent line of sight for precise, confident cuts.